Horticultural Netting HORTOMALLAS in flower growing. 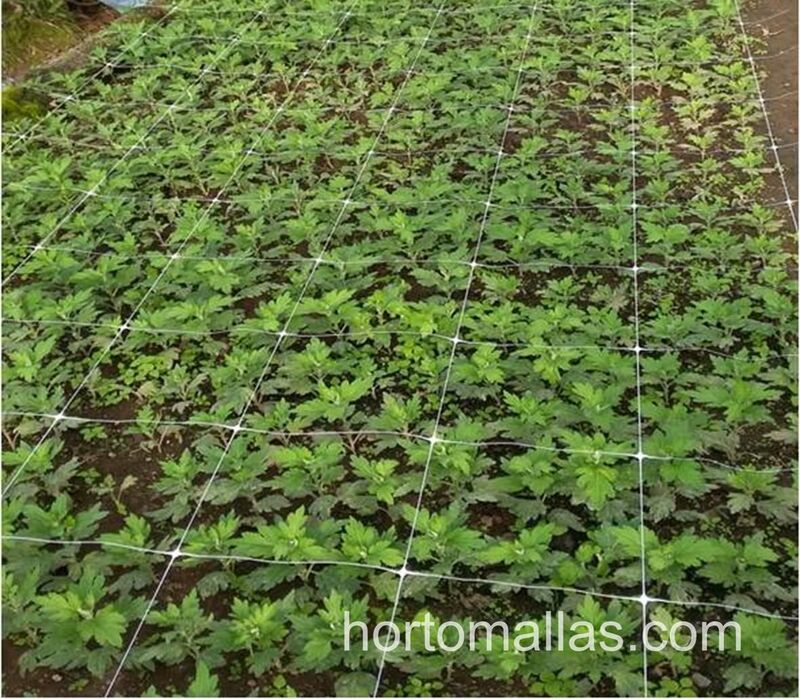 Using HORTOMALLAS horticultural netting in flower growing is an essential factor for the success of any horticulturist. It is preferable to elevate the flowerbed 15 to 20 cm off the ground, with a width of 1.05m and spaced 0.45m apart, on top of which you place, ideally, a horticultural net in four 25 x 25 cm squares, which will guide the plants as they grow. For effective commercial use of inflorescent plants, good panicle cleanliness and straight stems, tutoring is essential practice. You can put horticultural netting also known as vegetable support nets in squares of 20cm x 20cm or 15 x 15cm, 20cm off the ground, which can be made of wire, plastic tubing or string; it should be taken into account that if very strong growth occurs and the shoots are not thinned out, then they could pull up nets made from weaker materials. Next, you can gradually put in vertical trellises above the netting and leaving a 25 to 30cm gap in between, along both sides of the flowerbed, and using a minimum of 3 to 4 ties. Two ties should be attached in the middle of the arch, separated by 20 to 30 cm, to prevent the plants from leaning against the trellis netting as much as possible. It is equally important to keep the walkways clear of stems so that you do not damage them as you go past, and to allow the flowerbeds to be ventilated, which is vital as the plants grow abundant foliage. Plant Tutoring can be used as one, single support system that is gradually raised according to the rate of growth, with two squares of 50 by 50cm or three squares of 33 by 33cm, which will work together with the horticultural netting when growing flowers. The traditional method of planting in a 1.05m flowerbed, which takes advantage greenhouse features (irrigation, trellises, arches etc.) and allows for cultivating carnations, is arranged by elevating them to a height of 15 to 20cm above walkways of 0.45m wide. Trellising net of 7 15 x 15cm squares is fixed over the top, separated by at least 30cm from each other. You must make sure to do a thorough job and ensure that you have sufficient depths of around 40 to 50cm to allow the flowerbeds to ventilate. Using this framework, 6 rows of plants can be planted, three on each side of the flowerbed, with the central row of the SCROG trellis netting left free. The positioning of the plants in rows is in alternate squares and staggered in each block of three rows. By using this system, a planting density of approximately 24 plants per linear metre of flowerbed can be achieved and 15 plants per m² inside a greenhouse. Another possibility, if you want to give the plants the best possible environment, would be to reduce 50% of the plants from the inner rows of each block of three, which would lower the planting density to 21 plants per linear metre of flowerbed. An alternative planting system consists of planting in a 0.75m wide flowerbed with walkways of 0.5m. In this case, trellis netting of 5 squares of 15 x 15cm would be used, with the planting being carried out in two lines along both sides of the flowerbed using the horticultural netting, except in the central area which remains clear. In this way, a planting density of approximately 26 plants per linear metre of flowerbed can be achieved and 15 plants per m² inside a greenhouse. SCROG netting allows better light exposure for all plants, as all of them are confined in a mesh, allowing a vertical growth that is even for all shoots. 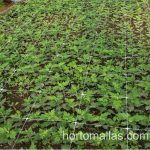 HORTOMALLAS net is used both in the SCROG and SOG flower bud tutoring method to maximize light exposure to each plant. The planting material is rooted cuttings that are planted in peat and perlite, lightly covering the rootball and making sure that it is in good contact with the soil. They must be treated with care to protect them from dramatic temperature changes. At the outset, they should be placed in cool and shady spots, and then be moved in the afternoon when temperatures have dropped. Goldenrods (Solidagos) can be planted year round with the appropriate equipment and heating backup, although it’s not advisable to plant during low temperatures; the ideal seasons are spring and summer. Can this net be used for holding medicinal buds in place like a SCROG netting (screen of green), also as a SOG net?